The following information was assembled as background just before the dedication of the Occoneechee State Natural Area. Although Occoneechee mountain has been a part of the state park since that dedication on July 20, 1999, this background continues to provide meaningful detail about the mountain and it’s environment. WHEN OCCONEECHEE MOUNTAIN IS DEDICATED as a State Natural Area this summer the long journey of preserving this unique site will be near completion. Dedication will be monumental in the history of this landmark, which only recently witnessed the movements of Native Americans. For the first 200 years of European presence in and around Hillsborough, Occoneechee Mountain was respected and feared as well as enjoyed and exploited. Rising prominantly above the rolling terrain of Orange County, it guided travelers approaching this capital of the infant State of North Carolina. Despite the proximity of a burgeoning population it remained wild, serving as the final refuge for the last panther in the region. Its rock was taken to build the foundation for the original North Carolina Railroad, and its flanks were settled by families who manned the looms of Eno Cotton Mill. Many an older citizen of Hillsborough can tell stories of exploring and playing on Occoneechee Mountain. This mountain, deserving of protection, has had a long and intimate history with the people around it. Gradually Occoneechee Mountain became appreciated for its geological uniqueness and unusual assemblage of plants and animals. Its rock was baked and transformed deep within the earth by volcanic activity early in the Paleozoic (~500 million years ago). Fractures developed which were filled with an assortment of minerals, one of which, pyrophyllite, is actively mined today east of the Natural Area. In the geologic present the nature of the mountain’s rock and the shaping force of the Eno made it an Ice Age outpost, a refugia for species which long ago migrated north in a warming climate. Its northern slope rises abruptly and steeply over 350 feet from the sluggish Eno waters, creating very cool and moist conditions. This mountain-like setting provides home to several disjunct plants including Catawba rhododendron, sarsaparilla, galax, mountain witch-alder and sweet pinesap. Among the 18 different ferns on Occoneechee Mountain, Bradley’s spleenwort, mountain spleenwort and climbing fern are far removed from their common range. The cool dampness of the northern exposure contrasts sharply with the spare, rocky soils of the southern slopes. This contrasting terrain nurtures rich and diverse natural communities. Chestnut, scarlet and blackjack oaks and Virginia pine dominate the extremely hot and dry slopes. A greater diversity of trees inhabits moister sites. Various shrubs are also abundant and create a splendid floral display each spring. Members of the heath family are particularly common such as mountain laurel, azalea, blueberries, huckleberry, and staggerbush. Many small herbaceous wildflowers are spread throughout. 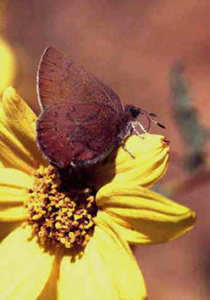 The large, extensive montane communities also support a couple of disjunct butterflies, the brown elfin and silvery checkerspot. 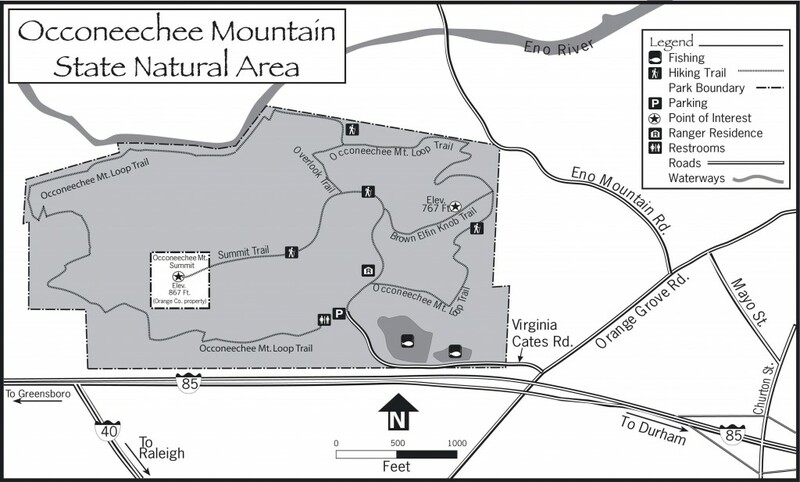 Occoneechee Mountain stands alone in many ways amidst the rapidly changing landscape of the Triangle. 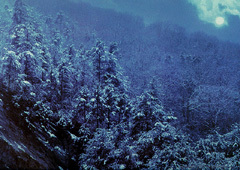 Protection of Occoneechee Mountain began 40 years ago through the far-sighted efforts of Allen and Pauline Lloyd. In the early 1960’s, soon after a mining operation opened on the eastern summit of the mountain ridge, the Lloyds purchased 66 critical acres to the west for preservation. Then in 1987 Cone Mills donated twenty-eight acres to the Town of Hillsborough, which established the Occoneechee Mountain Park Committee to develop a park. Over several years plans were made and trails were built, but lack of access prevented a formal park from opening. Still, people continued to visit the mountain. Then in 1993 Margaret Nygard and George Pyne set out to preserve Occoneechee. The Eno River Association raised $17,000 to purchase a timber contract on private mountain land. Simultaneously the NC Division of Parks and Recreation was lobbied to take on Occoneechee as a satellite to Eno River State Park. Funds were soon appropriated from the Natural Heritage Trust Fund to purchase land, and The Nature Conservancy purchased 96 acres for the State. Today these acres, plus a management lease on the Town of Hillsborough’s property, form the beginnings of Occoneechee Mountain State Natural Area. Eventually the site should encompass about 250 acres as additional tracts of land are purchased or received as gifts. The preservation of Occoneechee Mountain has been the result of vision, dedication, and long hours by many people. Their hard work is our lasting gain.